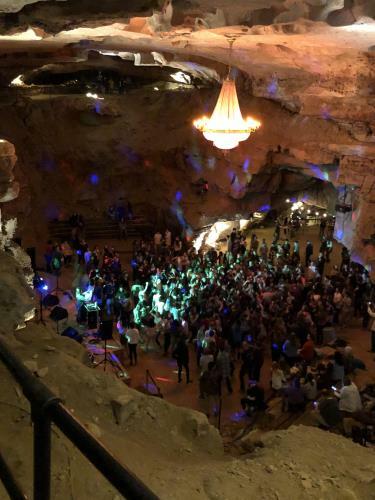 Approximately 500 youth of The Church of Jesus Christ of Latter-day Saints and their friends packed the Cumberland Caverns for a multi-Stake (regional) dance that included youth from Cookeville, McMinnville, and Chattanooga. 114 attended from Chattanooga. Chattanooga Stake Young Women’s President Shauna Hatch and her Second Counselor, Cindy Wolfe, served as chaperones for the Chattanooga Stake. Youth organizers from Cookeville and McMinnville Stakes (Bess Clemons and Jenny Nafrada) served as hosts. Young Men’s President, Thomas Hale, and his First Counselor, Ryan Sink, represented as the Chattanooga Stake Young Men chaperones. The Church of Jesus Christ of Latter-day Saints has an initiative for youth that builds on home-centered, Church-supported principles. The desire of the Church of Jesus Christ is to help young men and women “build faith in Jesus Christ, increase unity, and enjoy opportunities to serve one another and do the Lord’s work.” The Church also helps young men and women “build character and resilience, develop life skills, and fulfill their divine roles as daughters and sons of God.” Some activities, like the multi-Stake dance held for youth ages 14-18, create an environment where youth can develop friendships and interact with others in a safe setting that follows Church standards, including modest dress and grooming, and where no alcohol or other drugs are permitted. For the Strength of Youthis a booklet that outlines the standards that will help today’s youth remain valiant and steadfast in following the Savior. The Savior keeps His promises, and every young man and young woman is encouraged to follow Him and be an influence for good. For a free copy of the For the Strength of Youthbooklet which teaches about agency and accountability, dating, dress and appearance, education, entertainment and media, family, friends, gratitude, honesty and integrity, language, music and dancing, physical and emotional health, repentance, Sabbath day observance, service, tithes and offerings, and work and self-reliance, and how to go forward with faith, please download at https://www.lds.org/youth/for-the-strength-of-youth?lang=eng.